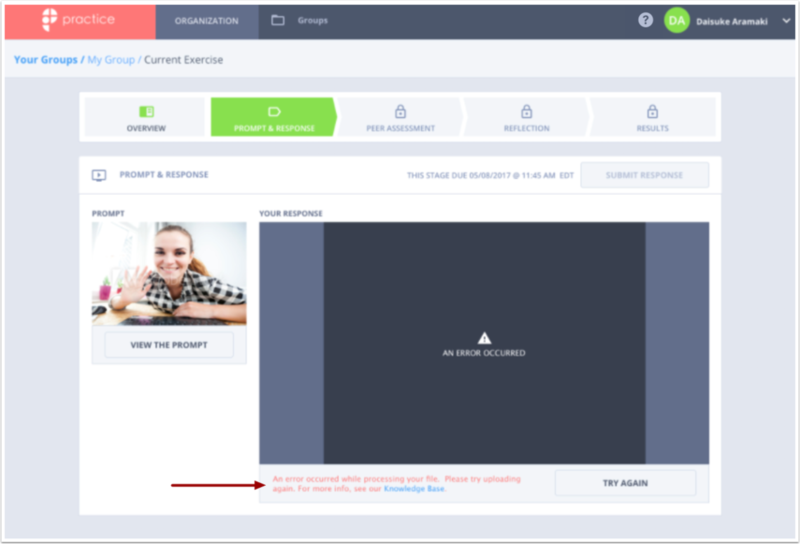 In Practice, you can upload pre-recorded video or audio files as exercise prompts, model responses, or learner exercise submissions. These files can be up to 1 GB (gigabyte) in size. Practice accepts MOV, MP4, WebM, FLV, AVI, MPG, or MPEG video files and MP3, AAC, WMA, and AIFF audio files. If you upload a video file and run into a processing error, it's likely that the video file you uploaded was invalid. To determine if this is the issue, first check to see if you are able to watch your video file on your computer. If you are able to watch your video, then there may have been an error with the upload. In this case, delete your Submission, and re-submit your video. Previous Topic:What is the optimal internet speed for uploading my video response as any user in Practice? Next Topic:Why is it taking so long for my video to upload as any user in Practice? Table of Contents > Troubleshooting > What type of media files does Practice support for all user roles?